mmeiser blog: The Ventilux a "soft fan"
The Ventilux a "soft fan"
Meaningless, senseless, gratuitous eye candy. So of course it's a good blog post. Noiseless fan with soft rotor. Designer Reinhard Zetsche contacted us to update our item on the KWC Murano faucet, which led us to his latest design, the noiseless Ventilux (also seen on Sensory Impact). Zetsche is busy, he's also part of trans|alpin. As for the Ventilux, it's made by Germany's Next and is available in green, pink, fluorescent orange, silver and anthracite. 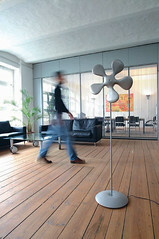 The stand is made of anodized aluminium.